Forever Gutter Cover™ stands heads above the rest in gutter protection. 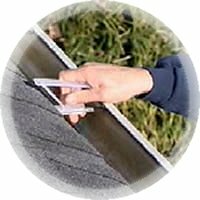 This innovative process allows you hassle-free, leaf shedding gutter guards. Heavy rain and high winds that blow debris such as leaves or pine needles onto your roof would normally slide directly into your gutters along with the rain. This creates clogged gutters which result in a messy cleanup and can also cause soil erosion, basement flooding, landscape damage, and the possibility of mosquito infestation. Our unique design utilizes water adhesion in which the water follows the Gutter cover and flows directly into the gutter. There is no room for debris.